died suddenly last Monday night. He was about 60 years of age. His military service included "Choate, Austin Pri R 30 KY Cav 1864 Jamestown, Fentress County, Tennessee"
Martha Ellen HART was born 12 September 1846 in Kentucky. She is the daughter of Socrates Hart of Russell, Kentucky and Nancy Brown. When her husband, Austin Choate died, she had two children still living at home. By the 1910 Census, she had moved in with her son Jasper and his wife Martha Elizabeth Cooper Choate. She was still living with her son Jasper in the 1920 Census. The 1900 Census shows that Martha stated that she was the mother of 8 children and that 5 of her children were living in 1900. * Rebecca Jane Choate was born 8 August 1866 in Little Crab, Fentress County, Tennessee. She married John Benton Beaty on 13 February 1886. She died 25 June 1935 in Fentress County, Tennessee. She was the mother of 10 children. Rebecca is buried with her husband in Storie Cemetery in Fentress County, Tennessee. The 1966 compilation of The Choate Family does not elaborate on "Becky Choate." 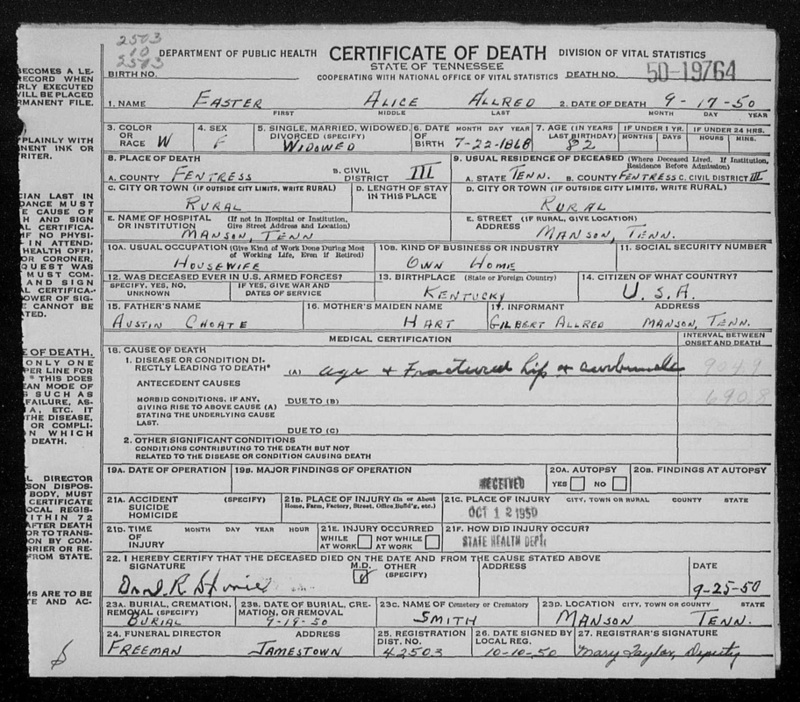 All records of this daughter was found on ancestry.com and other resources. Easter Alice Choate was born 22 July 1868 in Fentress County, Tennessee. She married Thomas Allred and they were the parents of eight children. Ester died 17 February 1950 and is buried in the Andy Smith-Manson Cemetery in Manson, Fentress County, Tennessee. Rufus Choate was born 13 July 1871 in Little Crab, Fentress County, Tennessee. Rufus married Sarah Jane Hood on 5 December 1907 in Fentress County, Tennessee. Rufus and Sarah were the parents of 13 children. 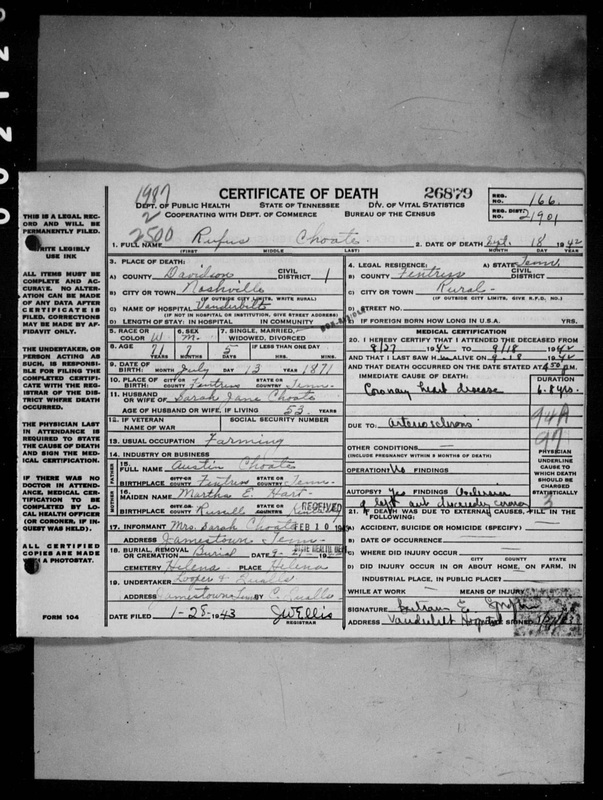 Rufus died 18 Septemeber 1942 and is buried in the New Hope Baptist Church Cemetery in Fentress County, Tennessee. Jasper C. Choate was born 24 April 1880 in Fentress County, Tennessee. He married Martha Elizabeth Cooper. Jasper and Martha were the parents of four children. Sometime between the 1900 and 1910 Census, he moved his mother Martha Ellen Hart Choate in with his family. Jasper Choate died on 28 March 1941 and is buried in the Storie Cemetery in Fentress County, Tennessee. Born 19 September 1875 in Fentress County, Tennessee. Martha died 15 March 1937 in Fentress County, Tennessee and is buried with her husband in Storie Cemetery, Fentress County, Tennessee. Clark Choate was born 28 January 1883 in Fentress County, Tennessee. He married Mary Magdelene Reynolds 25 April 1909 in Fentress County, Tennessee. Clark and Mary were the parents of 12 children. Clark passed away on 1 June 1950 in Fentress County, and is buried in the New Hope Baptist Cemetery in Fentress County, Tennessee. Born 12 December 1891 in Fentress County Tennessee and died on 23 September 1979 and is buried with her husband in New Hope Baptist Cemetery in Fentress County, Tennessee.